It was very short notice, same day 'designer choice': we used roses, tulips, acacia, cymbidium orchids, peruvian lilies, gerberas, some other fillers and greenery, in a matching container, decorated with raffia. 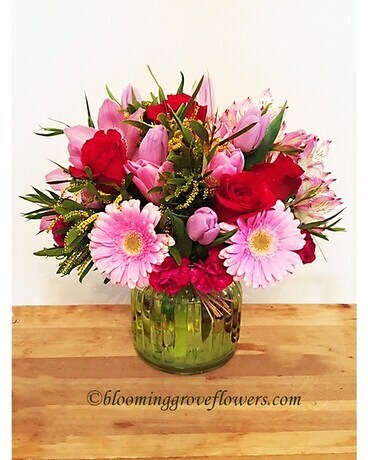 *Note: Exact flowers and presentation may vary with seasonal and local availability to assure the best quality and selection for your special gift. Please call to discuss, if you have any questions.